How Long Do Girls Play with Dollhouses? - Find Out Here! As parents, it’s important that we consider how long a toy is going to last before purchasing it for our child. The last thing we want to do is invest hundreds of dollars in a big toy that will only be played with for a few days, to then gather dust in the corner of the playroom. Fortunately, dollhouses are not that kind of toy. Most girls will get years of enjoyment from their dollhouses, even beyond the upper limit of the recommended age range of the dollhouse. Many parents report that their daughters, even at 7-9 years old, are still playing with dollhouses that are meant for kids from 3-5 years old. As with most things, there’s not going to be one set answer for this question. You’ll want to take these things into consideration before buying a dollhouse for your daughter. Every girl is different, and each one has favorite toys they like to play with. 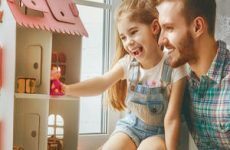 Some kids will enjoy playing with their dollhouse as a toddler, but their interest may start to wane as they get older. Once they start playing with “screen toys”, such as phones, iPads, and other electronic toys, you may notice they play less with their other toys. The other half of girls will enjoy the role-playing and fun that dollhouses provide, and they’ll continue playing with them as they get older, even into their pre-teen years. The nice thing with dollhouses is that, even on the low end, most kids will get enjoyment from their dollhouse for at least a few years. The answer is also going to depend on the type of dollhouse you get for your daughter. Some dollhouses are basic in their design and are geared towards young toddlers. The most popular Fisher-Price models are meant for kids ages 12 months and older. It’s common with these dollhouses that kids ages 4 and above will begin to lose interest in some of the more simple features of the dollhouse. As with most toys, there are different dollhouses for different age groups. If your daughter is younger, you can always upgrade to different dollhouses as they get older. Most girls, at some point, will begin collecting Barbies and will want a dollhouse where they all can live. Most parents will upgrade to a newer dollhouse big enough for Barbie dolls when their daughter is five or six years old. These girls may play with their Barbie house until they are pre-teenagers. Dollhouses come in all shapes, sizes, and varieties. You can find out homes for kids as young as 12 months old and you can find dollhouses for teenage girls and adults. Obviously, there is going to be a difference in the complexity and type of play that the dollhouses on each end of this range provide. As you begin shopping for a dollhouse, you’ll see a lot of different designs based on the age range you’re looking at. Most dollhouses in this age range are simple in both the design and furniture. Manufacturers don’t want dollhouses to easily break or for there to be small pieces that kids can choke on. The dolls themselves are typically molded plastic with no moving parts and items in the dollhouse are bulky and able to withstand rougher play. Also, you’ll find that most dollhouses have some interactive features, such as buttons that will mimic a flushing toilet, play songs, and make other common home sounds. Dollhouses at this age range are also very educational as young toddlers are beginning to learn sound associations. The best dollhouses for toddlers 1-3 years old typically include a combination of the features above. At this age, most kids are over putting small items in their mouths. At this age, your daughter may begin asking for a Barbie dollhouse for her growing Barbie collection. Most dollhouses for younger kids are smaller so that they are more accessible to small toddlers sitting on the ground. As your kid gets older, they are able to reach up and play with rooms in a three- or four-level dollhouse since they’re taller and able to stand and play. You will also see many dollhouses in this age group that come with a bunch of furniture and, most times, it’s plastic and more intricately designed than the furniture in younger dollhouses. The dolls in this age range usually have movable arms, legs, heads, and are poseable. Dollhouses for these ages are good at fostering role-play abilities. allowing your daughter to “play house” and decorate their dollhouse however they see fit. Kids in this age range will still play with Barbie dollhouses and other homes designed for kids slightly younger. As your daughter nears the upper end of this age range, you’ll see a move towards dollhouse kits and other DIY dollhouses. At this age, a lot of girls will like putting together and designing a dollhouse exactly the way they want. They’ll have fun painting the walls, the exterior, and creating designs. There are many different dollhouse kits for kids of all ability levels. Depending on the kid, you may have a teenager that enjoys putting dollhouse kits together as well. These are great at teaching patience, mechanical skills, and learning to follow directions and put things together. These dollhouse kits are a lot of fun for adults too. As your child gets older, they may continue putting dollhouse kits together and having dollhouses well into their adult years. This is going to depend on your daughter, but for most kids, a dollhouse is a great toy between their first and second birthdays. At this age, they’re beginning to explore and learn the world around them at their level. Manufacturers design dollhouses to help educate young toddlers as they’re exploring. If your child is older than this age range, you may want to graduate to the next level – such as a KidKraft dollhouse. There really isn’t a minimum age for dollhouses, as long as your child is able to get around and play on their own. They’ll have a lot of fun with the different dollhouse options in their age group.